Hazelwood School in Limpsfield officially opened the Baily Building at the end of last term with a Gala Concert, performed in The Bawtree Hall, featuring over 200 of the school’s most talented musicians performing alongside friends, family and the acapella singing sensation Voces8. The doors of the magnificent new Baily Building were thrown open at the start of the new academic year in September. After a year of construction upheaval, this most amazing of teaching environments oozes style, space and light. There’s also a 450-seater auditorium, The Bawtree Hall, named after the school’s longest serving head. There was some fine ensemble playing by the school orchestra, the wind and string bands as well as some virtuoso solo and duet performances. Equally powerful was the singing of the choir whose challenging programme drew its musical inspiration from Africa, Eastern Europe and 19th century France. The concert was a fitting showcase for the school’s rich musical tradition and was hugely appreciated by the packed audience who raised the lofty roof with their tumultuous applause. The school were delighted that Mr and Mrs Bawtree, and descendants of the school’s founders, Mr and Mrs Baily, were able to join its other VIP guests for the very special occasion. The school’s Chapel Choir travels to Verona at Easter hoping to repeat their success two years ago when they were awarded a gold medal in the International Music Festival held in Prague. 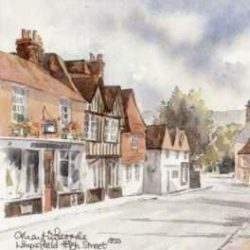 Next PostNext Flashback Friday: Limpsfield Village in the snow?